The Polycom VVX 1500, available from Adtec Communications, unifies voice, video and applications capabilities into a simple-to-use business media phone. With its unique touch screen interface, the VVX 1500 makes video calls as simple as using a phone. Its large display and ease of use make the VVX 1500 an ideal all-in-one productivity tool for today’s busy executives and professionals, whether they are in office, retail, professional services, or healthcare environments. 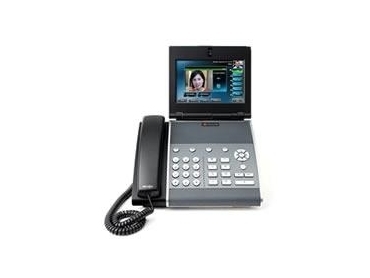 The Polycom VVX 1500 is equipped with all of the capabilities of a full featured Polycom SoundPoint IP phone including: six lines, Polycom HD Voice, a Gigabit Ethernet switch that supports PoE, and a host of rich telephony functions. These features can be accessed via the buttons on the front of the phone or by simply touching the large color display. The Polycom VVX 1500 features an open API and microbrowser that enable third-party applications developers to integrate the VVX 1500 with business applications such as unified communications, customer relationship management (CRM), and appointment management systems. The touch-screen user interface of the VVX 1500 includes a menu screen on which developers can place icons for users to touch and launch their applications. The VVX 1500 comes bundled with several applications including the Polycom Productivity Suite, which enables users to initiate and control audio conference calls right from the touch screen of the VVX 1500 as well as record audio calls locally using a flash drive in the phone’s USB port. The VVX 1500 also features a Web service called Polycom My Info Portal, through which customers can select to receive content such as local weather reports and other personalized information on the screen when the phone is not in a voice or video call. • Reduced Carbon Footprint Require less than half the power of similar products. Designed for lower power consumption using energy-saving PoE and smart motion detection technology.